“We urge policymakers in key capitals to support the deal and the steps necessary to ensure timely implementation and rigorous compliance with the agreement,” wrote the signatories, who included Robert Einhorn, a former State Department official and past negotiator on the Iran talks and former U.S. Ambassador to the U.N. Thomas R. Pickering. 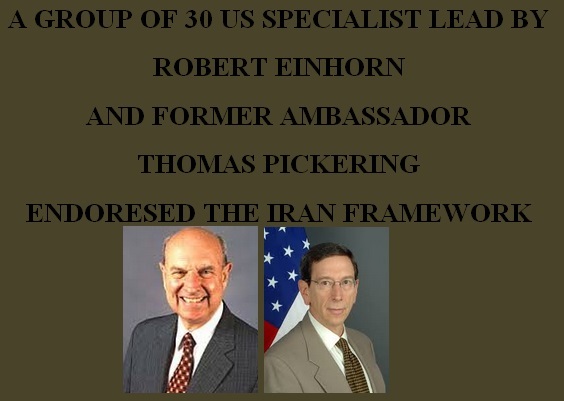 Pickering and Einhorn also were among 50 former diplomats, defense officials and political leaders who signed a separate statement which, in more cautious language, urged Congress to stay patient and “to take no action that would impede further progress or undermine the American negotiators’ efforts.” The statement was released by The Iran Project, an independent organization that tries to improve U.S.-Iran ties. This entry was posted on April 7, 2015 at 5:23 pm and is filed under Uncategorized with tags 30 US Specialist, Allies, Diplomacy, Endorsed Iran Framework, Give Peace A Chance, Iran, Iran Framework, Netanyahu Warmoner, No More War, President Obama, Republican Traitor, Robert Einhorn, Thomas Pickering, United States. You can follow any responses to this entry through the RSS 2.0 feed. Both comments and pings are currently closed.